As a kid who grew up with arcades around every corner, nothing feels better to me than sitting down with a balltop joystick and several clacking buttons. But the 90s also gave birth to the universally panned Virtual Boy. Oddly enough, one determined fan has taken the time to produce a high-quality arcade stick for this strange 3D console. Nintendo is flying high right now with the success of the Switch, but the company hasn’t always made the best decisions when it comes to platform development. The Virtual Boy, a bizarre piece of video game ephemera released in 1995 that only enjoyed a couple years of support before being abandoned, still stands out as one of Nintendo’s worst blunders. Its creator, Gunpei Yokoi, is largely credited with popularizing handheld gaming with the original Game Boy, but the stand-mounted Virtual Boy failed to take off in the same way due to its prohibitive price point and unwieldy design. Despite these flaws, the Virtual Boy has still managed to find a cult following over the last couple of decades. 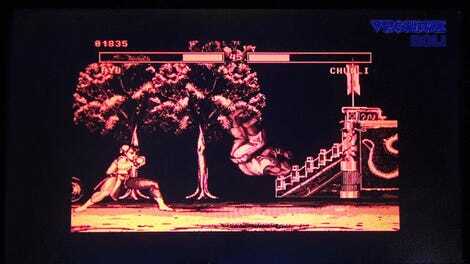 Homebrew developers have also addressed the system’s lack of fighting games—well, unless you count the first-person boxing game Teleroboxer—with an unofficial Street Fighter II port in 2015 called Hyper Fighting, and sites like Planet Virtual Boy continue to provide news and discussion about the unappreciated platform. Every good fighting game needs a good arcade stick to go along with it, and the Virtual Boy’s default controller simply doesn’t cut it. Enter Benj Edwards, a journalist, tech historian, and musician who began making arcade-style peripherals in 2016 after finding his various Atari 2600 joysticks wanting while trying to set high scores in Nibbler. Since then, he has built arcade sticks for the original Nintendo Entertainment System, the Super Nintendo, the Sega Genesis, the PC Engine, and the Atari 7800. Making arcade sticks for popular past consoles makes sense , but his latest project, a Virtual Boy joystick known as the BX-240, took me by surprise when he unveiled it earlier this week. Since these practical beginnings, Edwards tells Kotaku that his current interest in crafting arcade sticks comes more from trying to “surprise and delight” his friend and fellow Retronauts host Jeremy Parish. After Parish came into possession of a few Virtual Boys for creating videos, Edwards thought it would be fun to make an arcade stick for the 3D system, solely because of the console’s obscurity. He admits that he also has something of a soft spot for the console after grabbing one on clearance in 1995 and then writing about it for FastCompany in 2015. “In short, the answer is ‘because it’s neat and unexpected,’” Edwards said via email. When it came time to design a more fighting game-oriented arcade stick for use with Hyper Fighting, Edwards combined the design from his Super Nintendo joystick, the BX-110, with the work he had already completed on the BX-250. The original Virtual Boy controller wasn’t designed with fighting games in mind, but the new BX-240 moves the requisite buttons to a more comfortable six-button arcade layout. Also, much like with his earlier projects, Edwards uses joysticks and buttons from Japanese manufacturer Sanwa Denshi—the same parts you’ll find in many modern arcade sticks—to ensure the best quality. The only problem is that Hyper Fighting has and likely will not be given a wide release due to its usual copyright restrictions, but Edwards says the BX-240 can technically be used with any official Virtual Boy game. “The main difference is that all the functions of the right D-pad on the original controller (i.e. up, down,) are mapped to separate pushbuttons instead,” he added. Since announcing his first prototype in December, Edwards has received a “handful” of orders, but doesn’t plan to mass produce them in the same way he does the BX-110 for Super Nintendo. 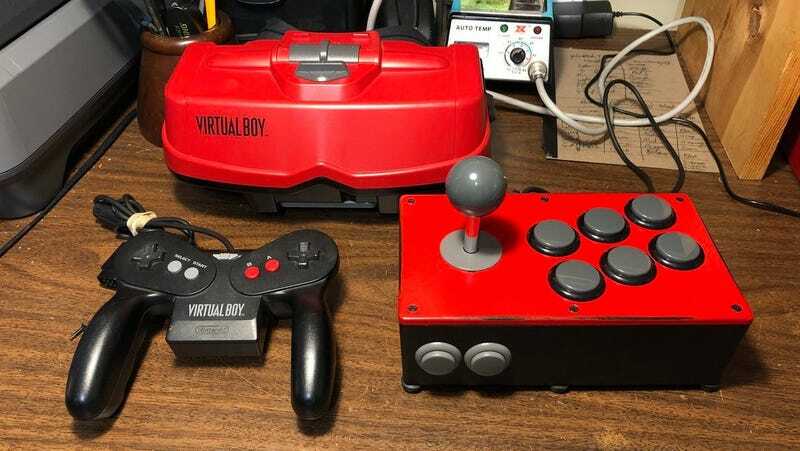 He has asked interested parties to send him a DM on Twitter if they want an arcade stick for their own Virtual Boy systems, but he has yet to finalize a price due to the complicated and time-consuming nature of their design. As for future projects, Edwards plans to keep it old school with designs of sticks for the Neo Geo, Sega Saturn, and PlayStation, but he’s also interested in trying his hand at wired joysticks for the Nintendo Switch and PlayStation 4 as well.